HDFC Bank Ltd has increased rates for fixed deposits (FDs) below Rs1 crore for most tenures above 1 year, in the range of 10-100 basis points (bps). One bps is one-hundredth of a percentage point. With this, the highest rate for non-bulk FDs (less than Rs1 crore) from HDFC Bank with a tenure of 1 year 17 days to 5 years has reached 7% (see graph). There has been no change for FDs of tenures longer than 5 years. Some customers of HDFC Bank received an email stating that the higher rates were available for just three days. However, the new rates will be applicable till the next revision, HDFC Bank clarified later. HDFC Bank is not the first lender to hike FD rates. In February, State Bank of India had increased rates on term deposits by 10-75 bps. Banks are increasing deposit rates to deal with the tightening liquidity condition. Banks use the money collected through deposits to lend to borrowers. If the demand for credit from borrowers goes up, more money should flow in, in the form of deposits. Data from the Reserve Bank of India (RBI) suggests that growth in demand for credit is higher than growth in deposits. For instance, for public sector banks, annual growth in aggregate deposits in the quarter ending December was 0.9%, while bank credit growth was 6%. Similarly, for private sector banks, deposits grew 13.5%, but credit growth was 23.6%, in the same period. This creates a mismatch. To rectify the situation, banks try to attract more depositors through higher FD rates. This also means that the cost of funds for banks is going up. This will impact the marginal cost of funds-based lending rates (MCLR), making MCLR-linked loans costlier in the next revision cycle. Which explains why interest rates on loans have also been increased by many large banks despite the RBI not having raised the repo rate. 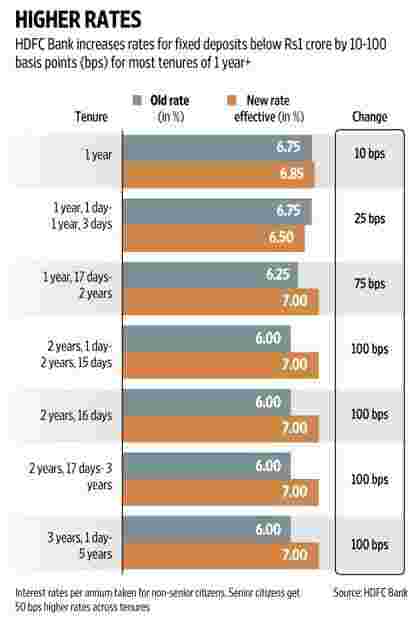 With the interest cycle turning, other banks too could revise their FD rates upwards to boost demand. Prakash Praharaj, founder, MaxSecure Financial Planners, said that as people are learning about mutual funds, many of them prefer to invest in them instead of FDs. Mutual funds also have some tax advantages over FDs. For instance, for Section 80C investments, mutual funds have a lock-in of three years, whereas tax-saving FDs have a lock-in of five years. Senior citizens too are opting for senior citizen schemes that give a return of 8%, said Praharaj. Though banks are increasing their FD rates, returns on an investment should not be the only deciding factor when you invest. You should also keep in mind your risk profile, investment time-frame, related goals and asset allocation. Asset allocation helps in diversifying your risk as well as in achieving financial goals in the most efficient manner; so when one asset goes down, it does not have a drastic impact on the entire portfolio.